Build, Measure, Learn sounds pretty simple. Build a product, get it into the real world, measure customers’ reactions and behaviors, learn from this, and use what you’ve learned to build something better. Repeat, learning whether to iterate, pivot or restart until you have something that customers love. While it sounds simple, the Build Measure Learn approach to product development is a radical improvement over the traditionalWaterfall model used throughout the 20thcentury to build and ship products. Back then, an entrepreneur used a serialproduct development process that proceeded step-by-step with little if any customer feedback. Founders assumed they understood customer problems/needs, wrote engineering requirements documents, designed the product,implemented/built the hardware/software, verified that it worked by testing it, and then introduced the product to customers in a formal coming out called first customer ship. Waterfall Development was all about execution of the requirements document. While early versions of the product were shared with customers in Alpha and Beta Testing,the goal of early customer access to the product was to uncover bugs not to provide feedback on features or usability. Only after shipping and attempting to sell the product would a startup hear any substantive feedback from customers. And too often, after months or even years of development, entrepreneurs learned the hard way that customers were not buying their product because they did not need or want most of its features. Best practices in software development started to move to agile development in the early 2000’s. This methodology improved on waterfall by building software iteratively and involving the customer. But it lacked a framework for testing all commercializationhypotheses outside of the building. With Agile you could end up satisfying every feature a customer asked for and still go out of business. 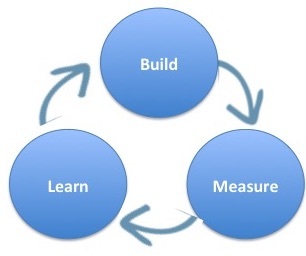 Then came the Build-Measure-learn focus of the Lean Startup. The goal of Build-Measure-Learn is not to build a final product to ship or even to build a prototype of a product, but to maximize learning through incremental and iterative engineering. (Learning could be about product features, customer needs, the right pricing and distribution channel, etc.) The “build” step refers to building a minimal viable product (an MVP.) It’s critical to understand that an MVP is not the product with fewer features. Rather it is the simplest thing that you can show to customers to get the most learning at that point in time. Early on in a startup, an MVP could simply be a PowerPoint slide, wireframe, clay model, sample data set, etc. Each time you build an MVP you also define what you are trying to test/measure. Later, as more is learned, the MVP’s go from low-fidelity to higher fidelity, but the goal continues to be to maximize learning not to build a beta/fully featured prototype of the product. A major improvement over Waterfall development, Build Measure Learn lets startups be fast, agile and efficient. 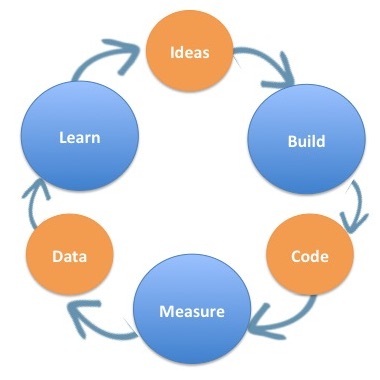 The three-circle diagram of Build Measure Learn is good approximation of the process. Unfortunately, using the word “build” first often confuses people. The diagram does seem to imply build stuff and throw it out of the building. A more detailed version of the Build Measure Learn diagram helps to clarify the meaning by adding three more elements: Ideas-Build-Code-Measure-Data-Learn. The five-part version of the Build Measure Learn diagram helps us see that the real intent of building is to test “ideas” – not just to build blindly without an objective. The circle labeled “code” could easily be labeled “build hardware” or “build artificial genome.” The circle labeled “data” indicates that after we measure our experiments we’ll use the data to further refine our learning. And the new learning will influence our next ideas. So we can see that the goal of Build-Measure-Learn isn’t just to build things, the goal is to build things to validate or invalidate the initial idea. The focus on testing specific ideas counters the concern that build-measure-learn is just throwing things against the wall and see if they work. But it’s still not good enough. We can now do better. What Build-Measure-Learn misses is that new ventures (both startups and new ideas in existing companies) don’t start with “ideas”, they start with hypotheses (a fancy word for guesses.) It’s important to understand that the words “idea ” and “hypotheses” mean two very different things. For most innovators the word “idea” conjures up an insight that immediately requires a plan to bring it to fruition. In contrast, a hypothesis means we have an educated guess that requires experimentation and data to validate or invalidate. That the Lean Startup begins with acknowledging that your idea is simply a series of untested hypotheses is a big idea. It’s a really big idea because what you build needs to match the hypothesis you want to test. The minimum viable product you’ll need to build to find the right customers is different from the minimum viable product you need for testing pricing, which is different from an MVP you would build to test specific product features. And all of these hypotheses (and minimal viable products) change over time as you learn more. So instead ofBuild-Measure-Learn, the diagram for building minimal viable products in a Lean Startup looks like Hypotheses – Experiments – Tests – Insights.